Dr. Laurence W. (Bill) Veihdeffer Jr. I am a dentist coming from a unique dental family—my father and two uncles were all dentists and my daughter is a hygienist. My father, the late Dr. Laurence Veihdeffer, attended the University of Buffalo and graduated in 1942. 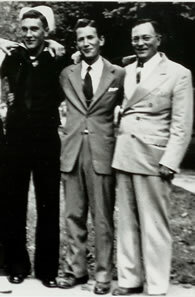 My two uncles, the late Norbert and Walter Veihdeffer both attended the University of Pittsburgh and graduated in 1931 and 1952, respectively. I am also a Pitt alumnus, graduating in the class of 1981. My daughter, Christy, attended West Virginia University’s School of Dentistry, Division of Dental Hygiene and graduated in 2006. My father comes from a family of nine, including himself, six siblings and his parents. Originally from central Pennsylvania, he grew up and lived in Niagara Falls, New York, which their family viewed as the land of opportunity because of the Niagara Mohawk Power Company. My father and two of his brothers chose to pursue a career in dentistry because it seemed to be a more rewarding career than the power company. 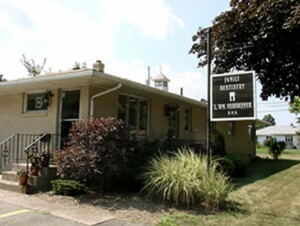 The oldest and first to become a dentist, Norbert, opened a practice in Erie, PA in the early 1940s after meeting his wife who was from the area. His office was located on West 7th Street, which is now the location of Gannon University’s Zurn Building. Upon graduation, my father also moved to Erie to join his older brother’s practice in downtown Erie. However, within a few years he was called to duty by the U.S. Air Force during the Korean conflict and served as a captain, treating servicemen at the base in Dover, Delaware from 1952-54. He returned to practice in Erie with Norbert. The youngest of the dental trio, Walter, joined the two brothers in their private practice in the 1950s—making for cramped quarters. Norbert, Larry and Walt practiced together for about five years under these conditions. The office had three operatories, each one with the belt-driven slow speed hand pieces. In 1959, Norbert was looking to retire and so moved to Florida, where he continued to work part-time. Gannon University had ambitions to expand at that time, so my father built a new standalone office for himself and Walt a few blocks away. The office was centrally located in downtown Erie on 10th and Chestnut near Gannon University and Cathedral Prep High School. The new building had four operatories and two hygiene rooms. One of the belt-driven slow speed hand pieces was also transferred to the lab at this location. Smoking was part of their generation and I can still remember the smell in both the waiting room and their lab where they took breaks in between patients. At the time, Larry and Walt lived in different parts of town and joined separate churches and belonged to different clubs to promote the practice. Growing up I liked to fix things around the house; probably many things that I was to blame for breaking in the first place. I remember my father telling me I ‘worked well with my hands’. I believe this is what sparked an interest in the dental field. I also remember being involved in a local youth program called the Indian Guides for fathers and sons. My father and I were often referred to as “Big Tooth” and “Little Tooth”. My father passed away while I was still an undergrad at the University of Dayton, with plans to go on to dental school. After completing a master’s degree in education at Gannon University, I graduated from The University of Pittsburgh Dental School in 1981 and soon joined my uncle at the family dental practice on 10th and Chestnut Street. After a brief time with my Uncle Walt, I started my own practice. As a young and enthusiastic practitioner using the latest methods—and having the benefit of the family name known in this city—I was fortunate that many patients from the original practice were happy to follow me. Over the years I have followed in my father’s footsteps by remaining involved in organized dentistry. This includes serving as President to the local and the district Dental Societies. I have been practicing solo in my current location in Erie for about 20 years. It is not uncommon to have relatives travel to the office from out-of-state to be treated by a “Veihdeffer”. I hired my daughter when she graduated from WVU and she has been with the practice since 2006 as a hygienist. With the addition of Christy to the team, we now have three generations of Veihdeffers who have been in dentistry continuously, with two generations always concurrent. Whether there will be a fourth generation is up to fate. Other members of all our families have spread out across the globe leaving the family business to my branch.